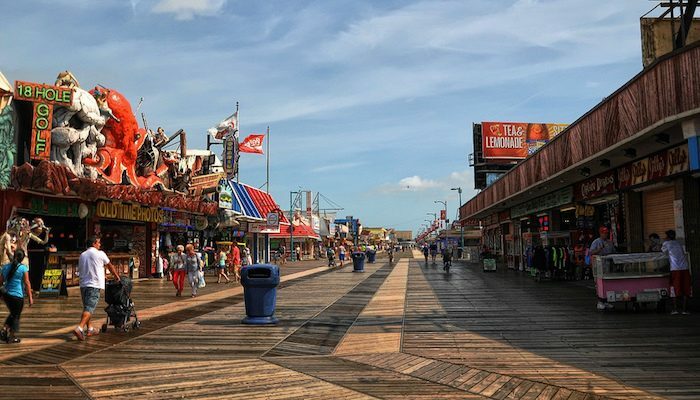 The Wildwood Boardwalk is the sort of boardwalk that defines boardwalks. It’s a treat to run its 3+ miles, especially if you can beat the crowds in summer. The concrete and wood route follows the coast for over three miles, from Rambler Park near Wildwood Crest to North Wildwood, near the seawall. There are great ocean views as well as the festive boardwalk atmosphere with its numerous amusement parks, shops, and restaurants. The Boardwalk starts in the west at Rambler Road Park and heads east towards the piers, where it turns from concrete to a true boardwalk. Towards Gateway 26, it turns back to concrete and continues east to meet up with John F. Kennedy Beach Drive, ending just before the seawall. It’s about 3.3 miles one way, 6.6 miles round trip, and is especially beautiful at sunrise, before the crowds roll in. You can continue on JFK Beach Drive to the seawall if you like, about 0.2 miles. The beach is also great for running — quite wide and generally firm sand. It can be crowded on a nice summer day, but is free and open to the public. It’s about 4.5 miles total, extending 1 mile west of the Boardwalk.